As we have stated a few times in our new endeavor, and this being doubly true for me, writing through this Epiphany season has been a learning experience. My goal and pleasure is to share with you my “Aha!” moments as they come to me while hoping those of you much smarter and informed than I will be gentle in your critique. I am fascinated with not only the story of the baptism of Jesus, but how those who constructed the liturgy were able to connect several passages together revealing the ways this simple act of submission by our Lord connects the old and the new covenants. If you have read the book of Isaiah, you know how the prophet takes on God’s voice and blasts the nation for turning away from him and tells of the day when they will be overrun by another nation. The first 39 chapters are pretty tough, honestly. Many references are made to disobedience while linking their present history with another, equally as shameful era – the forty years in the desert. Yet, there is a change in tone around the 40th chapter going through chapter 55. Some scholars call it “2nd Isaiah” where themes of hope and redemption rise unexpectedly from the ashes of the past. In fact, some of the most hopeful passages in the Old Testament come from these fifteen chapters. Ironically, this hope is placed directly after some of the more difficult words in scripture in the earlier parts of Isaiah. 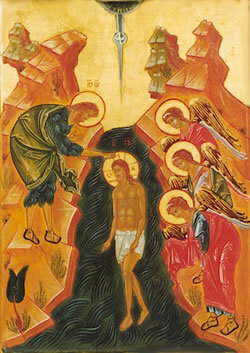 Fast forward to the baptism of Jesus. When Jesus passes through the waters of baptism, he connects us with the story of Israel. Just as Israel passed from slavery to freedom through the waters of the Red Sea (Exodus 14-15) and from homelessness to a homeland through the waters of the Jordan (Josh 3:15-16) – so we pass from death to life through those waters of baptism. Jesus in his act of submission entered the murky and dangerous waters, rose to received the blessing of his Father, then went into his ministry. Side note: though water was used for washing and purification in scripture, it also a source of fear. After all, where do you think the Leviathan lived? I come from a Christian tribe who places a large emphasis on baptism. And, I do not believe this importance to be unfounded. Yet, I think we can often cheapen the act by failing to understand how baptism connects us with the greater story of God. When we go into the waters of baptism, a proclamation is made that we in our darkest time can pass through and find a new name and calling. The act of baptism not only removes sin, but removes fear. Through Christ’s baptism, he showed us we can trust that God will stay with us even when we have to pass through the darkness of life. He will be on the other side. We have no reason to fear. What do you think about baptism? What theological importance does it hold for you? This entry was posted in Epiphany and tagged Baptism, Fear, Freedom, Isaiah. Bookmark the permalink. Chris, I love the idea of blogging through the advent calendar and I look forward to seeing more posts. Love the reference to Isaiah 43 and the Exodus theme. One’s liberation and experience of hope come at a cost. It is scary to cross the sea to the other side. The land may be dry, but there are walls of chaotic, death dealing water on each side of you. To learn to trust that those waters will be kept at bay as you cross is a furnace to the soul. Thank you for your post. Man thanks so much for your comment. I heard a friend of mine say that we often have a “low theology” of baptism when we only talk about whether or not it saves us. The more I have studied what baptism really does makes me love and believe in it more. I too love how it connects us to the ancient story and gives us a picture of what we are entering into when we confess Christ. Glad you are reading. And, I enjoyed catching up with some performances of Nicodemous Snow on YouTube. Love it.